Tibetans and their friends in the free world, from Australia to Asia and Europe to North and South America, have celebrated the centenary of this historic decree by His Holiness the 13th Dalai Lama which - in my view – has come to be known somewhat mistakenly as the "Declaration of Tibetan Independence". In the decree at no point do we find any hint that the Great Thirteenth was declaring the independence of his country for the first time. Instead we find consistent reiterations of her independent status throughout the history. The original document has not been found until now and it is probably lying somewhere in the Potala Palace among piles of historical documents. Fortunately we do have the text of this document as Tsepon W. D. Shakabpa copied it in 1927 during his tenure in Senge Dzong. Shakabpa, who has seen the original decree, speaks of a proclamation of the highest order with government seal (sbug dam rtsa tshig) in his landmark history book*, issued on the 8th Day of the 1st Month in the Female Water-Bull-Year of the 15th of 60 Year-Cycle of Tibetan Calendar, corresponding to February 1913. In the Tibetan Calendar, as we all know, the new moon is always on the first day of a month and we can reconstruct with some certainty that the new moon in February 1913 fell on the 6th. Since we have often missing (chad) and leap (lhag) days every month and year or even a leap month in the course of some years and presuming that between the 1st and 8th of the 1st Tibetan month there was neither missing nor leap day or days, the 8th day indeed fell on the 13th February 1913. But still, some claim that it fell on the 14th of February. Interestingly, Sir Charles Bell - a long time friend of the Tibetan leader and author of 4 books on Tibet in addition to his biography** and one on Tibetan grammar and undoubtedly one of the leading authorities on Tibet of the 1st half of the 20t Century, does not give any reference of this decree in that biography. It could well be that he simply wanted to write a portrait of his famous Tibetan friend as a human being and ruler rather than do a scientific study. This hypothesis is strengthened by the fact that in the "Chronological Table" on page 10 he mentions “1912, Dalai Lama repudiates Chinese over-lordship” without making any allusion to this decree. Until now no serious scholars have challenged the existence of this proclamation, as was the case with the Tibet-Mongolia-Treaty of January 1913 for decades. Fortunately some five years ago, a copy of the original treaty was discovered in the state archives of free Mongolia and surprisingly not in the archives of Chinese occupied Tibet. As such China is now called upon to open Tibetan historical documents to scholars and not first filter the documents with the intention of justifying her claims over Tibet and downplay or even negate the reforms initiated by Tibetans. The time of the 13th Dalai Lama (1876-1933) fell towards the end of the geopolitical rivalry between the two contending European powers Great Britain and Czarist Russia, known as the “Great Game”, as well as dramatic changes in China and the world at large. 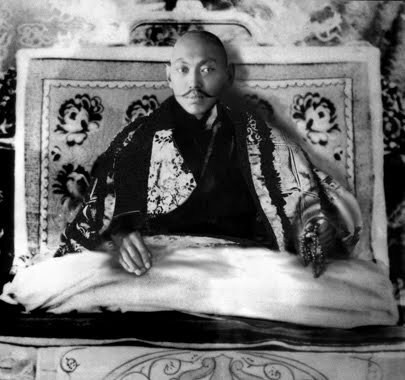 Within his relative short span of life, the 13th Dalai Lama had to go twice into exile: the first from 1904 to 1909 to Mongolia and China escaping the British invasion under Colonel Francis Younghusband. In China he was, however, not accorded the same respectful and cordial treatment which was given to the 5th Dalai Lama by the first Manchu-Qing-Emperor. The Qing Imperial Court this time even demanded from the 13th Dalai Lama that he performed Kowtow before the young Emperor and Empress Dowager which in such form - of course - was rejected by the Tibetan side. His second exile led him to India from December 1909 to June 1912, this time escaping the Manchu-Chinese army trying to conquer and control Tibet. Both in Darjeeling and Calcutta he and his entourage was given a more cordial treatment but received no assurances of political or military support as was hoped. Although the Great Thirteenth started his return journey from Darjeeling in June 1912 but he came back to Lhasa only on January 23 when all Chinese officials and soldiers were driven out of Central-Tibet. 22 days later he issued this proclamation containing 5 articles. Let us have a brief look at it. (4) Closing Protocol, indicating place and date of issue. In some decrees and documents apprecatio (prayers or blessings) is found either at the beginning or at the end of a decree. According to Dieter Schuh “in late Tibetan documents in the aftermath of Mongol rule invocatio, intitulatio and a noun of proclamation" are often missing in decrees of Tibetan rulers but we see in this decree that the 13th Dalai Lama uses both the noun of proclamation "gtam" and verb "zlo ba". Let us now examine in brief this decree in the light of the above four components. “I, King of the Victorious Ones (…) Vajra-Holder called the Dalai Lama, the Ocean-Like Teacher, prophesied by Lord Buddha from the Noble Land of India” is the intitulatio followed by the noun of proclamation “gtam” and the inscriptio of the publicatio names following destinatär “high, low and middle clergy and lay people, as well as to high civilian and military officials in this great medicinal land surrounded by mighty snow mountains”. “Prophesied by our compassionate teacher, Lord Buddha from the Noble Land of India, successive reincarnations of Avalokiteshvara from the times of the three religious kings to the present day took over the reign of this medicinal land and protected all sentient beings” is the legitimacy. Interestingly the legitimacy to rule over this Snow Land is given to successive Tibetan sovereigns by Lord Buddha and not by Emperors of China or Mongol-Khans. In the narratio we find detailed and concrete historical circumstances and events “nevertheless in recent times, Chinese authorities in Sichuan and Yunnan have not only caused unimaginable tyranny and oppression in their desire to seize our territory (…) I and my ministers left to the border intending to clarify via wire with Beijing that the existing relationship between Tibet and China had been that of preceptor-patron and not subordination of one to the other (…) Tibetans of all social strata continued their fight against Chinese troops and expelled them from Central Tibet. Thereupon, I have returned safely to my rightful and sacred land, and we shall drive out the remaining Chinese troops from Kham (…) As a golden age has been ushered in and sentient beings can now enjoy religious and material prosperity once more, clergy and lay people of all social strata should implement" this disposition containing five orders. Although there is no poenformel or threats of penalty in this decree but he sternly admonishes “Let copies be posted at major centers so that no one can say that he or she has not heard or seen it. Let the original be placed in the district registers to be handed over from outgoing to incoming officials, and let successive officials take care so that the proclamation achieves a sustained result”. From the Closing Protocol we know that this decree was issued on the “8th auspicious Day of the 1st Month of the Female Water-Bull Year in the Second Divine Palace, Potala”. In Article 4 he reiterates that Tibet is “an independent nation”. The 13th Dalai Lama, however, concedes that “China often seized illegally Tibetan territory in the past” (Article 4) but categorically states that the existing relationship is “not subordination of one to the other”. Tibetans in general and advocates of Rangtsen (Independence) in particular view that with this act Tibetans have proven to the outside world that Tibet was and is a sovereign country. This line of thought is being backed up by Charles Bell several times in his biography. The 13th Dalai Lama consistently states „that we are an independent nation; that China has claimed suzerainty over us, but we have never admitted this; that in 1912 we fought against the Chinese and drove them all out, the Amban and his soldiers; and since then we have governed the larger part of our own country” (page 394). Charles Bell further substantiates this on page 155. “A few months after the Dalai Lama returned to Tibet, Yuan Shihkai, the President of the Chinese Republic, telegraphed to him, apologising for the excesses of the Chinese troops, and restoring the Dalai Lama to his former rank. The Dalai Lama replied that he was not asking the Chinese Government for any rank, as he intended to exercise both temporal and spiritual rule in Tibet. Thus the holy sovereign made clear his declaration of Tibetan independence”. We know from Charles Bell that the Dalai Lama „was always quick to grasp the essential needs of his country“ (286) and ever since the Tibetan leader and the British Political Officer met in 1910 the later was impressed by the „courage and energy“ of the Great Thirteenth. In India „he was increasing his knowledge of the West and enlarging his horizons” (135). It is no wonder that in Article 2 to 4 he is admonishing his people to show more religious tolerance and improve the standard of religious practise as well as modernise the army, reform the administration, abolish inhuman punishments and introduce social justice. In Article 5 we find radical elements of land reform, some sort of environmental protection and strong sense of social justice and it is - in my view - the most important point of this decree. It may well also be the reason why this decree has failed to achieve sustained results. He sternly admonishes “landowners, be they state, private or monastic” not to prevent “poor and industrious households wishing to clear” land. No taxes or rent shall be levied for the first three years and thereafter only in “proportionate to the size of the cultivated land and yield. The right to cultivate the land will then belong to the cultivator forever”. This is definitely not a decree to protect only the hereditary rights and privileges of the three landowners. He demands from his officials to post copies of the decree “at major centers so that no one can say that he or she has not heard or seen it”. It is obvious that the state, aristocratic and monastic landowners were not interested in making this decree known, albeit put into practice. Successive officials all coming from aristocratic and monastic backgrounds also did not implement this proclamation and as such it failed to achieve “a sustained result”. The Great Thirteenth has seen to some extent in China but more in India how a country can develop materially. He describes in Article 5 that the situation prevailing in Tibet is “completely detrimental to the development of the country.” Thanks to Tsepon Shakabpa we have the text of this historic document showing that Tibetans themselves are willing and capable of initiating reforms. As such Tibetans indeed can take great pride in celebrating the centenary of this decree. * W.D. Shakabpa “Political History of Tibet” in Tibetan language, Vol. II, Third Edition, Dharamsala, 1986, page 219 to 223. ** Sir Charles Bell “Portrait of a Dalai Lama – The Life and Times of the Great Thirteenth” Collins, London 1946. Republished by Wisdom Publications, London, 1987.